I just finished sewing up the Sis Boom Rebecca Dress. If you aren't familiar with Sis Boom PDF patterns, they are very clear and easy to follow with step-by-step photos. Last summer, I tried out the Jamie Dress, and I was sold on the easy techniques shown for everything from inserting a zipper to finishing a garment's raw edges. This pattern will teach you how to make bias tape and apply facing to the neckline, among other things. The fabric I chose was Denyse Schmidt Greenfield Hill (Cranberry colorway), picked up on our trip to Nashville last weekend. I saw it on the bolt at Textile Fabrics and gasped. It was half off! It was love. This PDF pattern is a whopping 417 pages long, because the printable pattern pieces are broken up by size XS-3X. I printed off 21 pages, cut and taped the pattern pieces together, and referred to the directions on my laptop. I appreciate the simple, sleek cut of this dress. I also appreciate having nearly a yard of this print left over. Success! 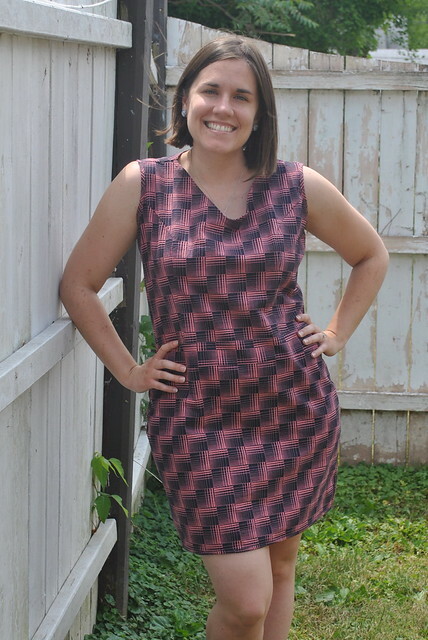 Linking up to the Summer Sewing Contest, Sew & Tell Friday and Sew Modern Monday! Super cute! Great summer dress! Looks so cute on you Lindsay! Dang that fabric is perfect for this dress. Nice job I just love it. SUPER cute!!! Way to go! So very cute, as always!! Job well done Lindsay! I love that line !!!! i love the dress!! it's darling! and sometimes i wish i had grabbed up some greenfield, i really love some of the prints - especially the voile.